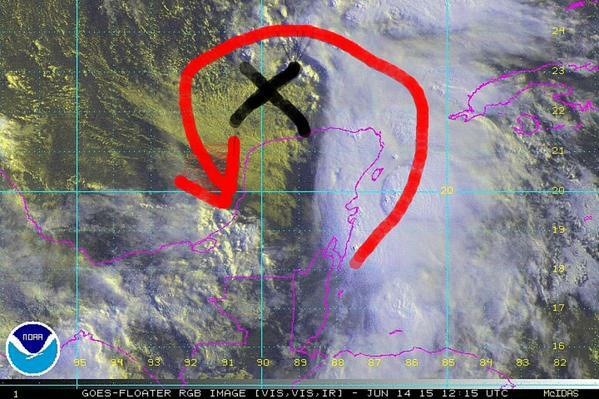 Invest 91L has gained a slightly better organization today with convection wrapping around the northern semicircle. Hurricane Hunters have not found a vivid center of circulation, but gale force winds are occurring on the eastern side. In the hurricane hunter’s first go through in Invest 91L, they found a very weak gyre with ever so slight drops in pressure toward the possible “center.” I use that word very loosely to represent where winds are spiraling towards. 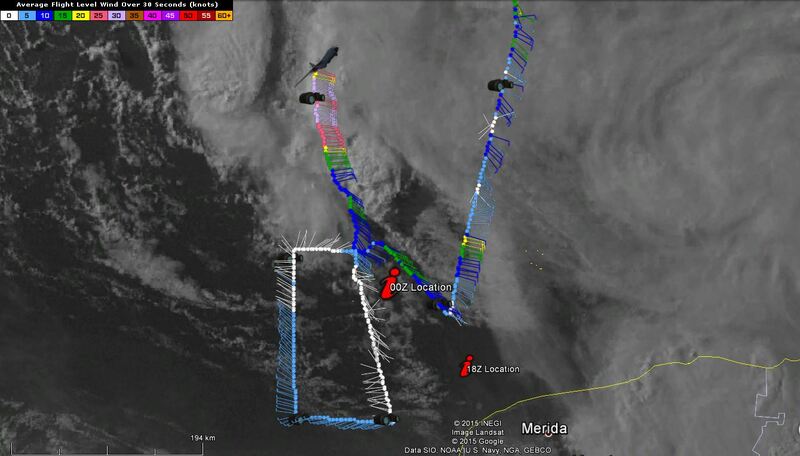 The highest winds in that gyre were only 5-10 kts, however higher winds were found to the north of that area. You can see those higher winds as the plane moved into the thunderstorm activity north of the gyre. It should be noted that on the graphic above that the location points likely do not suggest movement, but rather better information and/or relocation results. The hurricane hunters should be back into this system tomorrow morning with a take off time from Biloxi before sunrise. I’d like to jump right into the impacts tonight without dwelling on the meteorology just yet since impacts will probably far outweigh any science-y stuff. If you are in this for the meteorology, skip on down to the next section. As I mentioned yesterday, by far the main threat of this system is excessively heavy rainfall. 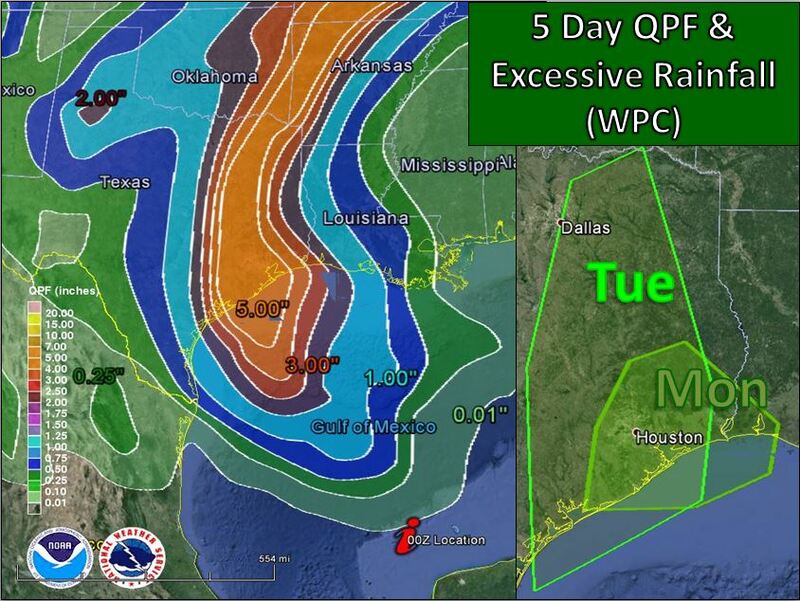 Through the next five days, the rainfall maps from the weather prediction center tell a sobering tale. Widespread rainfall amounts of 5″ are anticipated from Houston and Bay City across the Red River and up into southern Missouri. Localized rainfall amounts could be 2-3x that number. If your river flooded last month, you should be taking precautions to mitigate this rainfall sooner rather than later. The WPC has also issued a slight risk of excessive rainfall on Monday and Tuesday in the areas outlined in green below. I would expect these outlooks to be upgraded with time. It can only be anticipated that there will be more loss of vehicles with this storm, which at this time can probably be treated more like a Goliath rain maker than a tropical system. Flash flood and/or flood watches will be going on across the upper Texas coast over the next 36 hours. Coastal Erosion/Surge: A strong fetch out of the southeast is already bringing in not-so-much needed rainfall to SE TX/SW LA, but it is also raising tidal levels there as well. It does not take a tropical system to produce surge. NWS LCH is already forecasting tides to range 2-4 feet above average low tide levels through Tuesday. Small levels of inundation, especially at high tide, is possible. Rip Currents: Where the winds are blowing at 90 degrees to the shoreline, expect rip currents early this week. Overall, it is not a good beach or boating week to start. Wind: I currently don’t think this will be a huge issue, but you may want to bring small items that may blow around inside. Winds are expected to be on the low end of the tropical storm spectrum. The RapidScat scatterometer had some very high wind vectors within the thunderstorm activity well to the east of the gyre found by recon tonight. Some contamination of winds from rapidscat by rainfall is to be suspected, but buoys in the area show tropical storm force wind gusts. The appearance on satellite looks more subtropical in nature, but that is mainly due to dry air on the western side and wind shear that is feeding the dry air in. RGB imagery from 12z at the beginning of the transitional process. Throughout this afternoon, the old upper level low that has been floating around the Gulf of Mexico aligned vertically with the gyre found by recon and began to pull thunderstorms counter-clockwise around itself. This is a crucial step for anyone who is rooting for cyclogenesis here because this is begins a transition from a top down development to a bottom up one. This thunderstorm activity can warm the core and begin to break down the upper level low. The next step, all else favorable, is for an anticyclone to begin forming aloft in place of the upper level low. This process usually takes a few days, but in this case seems to be occurring at a faster rate. Upper divergence in that process would be expected to decrease temporarily, and we are seeing that on the CIMSS charts this evening. Divergence would increase if/when an anticyclone forms. At this time, I believe that this will be upgraded to a tropical storm sometime tomorrow or early Tuesday. The winds for such classification (or sub-t classification) are already there, but we have to wait for the radius of maximum winds to decrease a bit with an uptick in organization for an upgrade. As I’ve eluded before, a name will only make this system easier to find in the history books instead of searching for Texas flood. Winds at this time are expected to be on the lower end of the tropical storm spectrum, however I should mention that a few of the hurricane models went bonkers with this system and had it intensifying Erin style after landfall. I don’t put much stock into that thought process at this time. At some point, this will transition to an extra-tropical system over the mid-Mississippi or Ohio river valley and intensification may result there, but we’ll talk about that bridge when we come to it provided it is not flooded over. While in the Gulf, modest intensification is possible. Water temperatures are warming as 91L gets closer to land, and shear is anticipated to drop some. A limited hindrance may come from dry air on the west or southwest side over the next day or so. The main hindrance to enhanced growth is vertical organization as I mentioned before. The most affected area of the coastline will probably be somewhere upcoast of Corpus Christi, again mainly affected by rainfall. I won’t be posting spaghetti plots tonight because I do not want people focusing on a a single line or model since impacts will be widespread.